OYE Swimwear "Lucette" two-piece swimsuit in solid microfiber. Crisscross, banded straps with cutout sides. 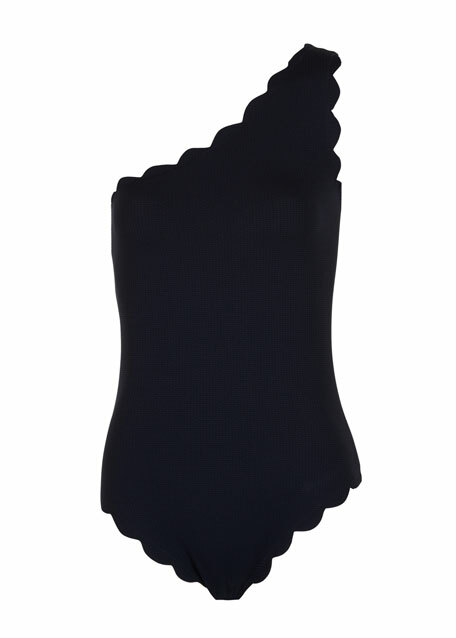 La Petite Robe di Chiara Boni "Chrysa" one-piece swimsuit in solid microfiber. One-shoulder neckline with floral ruffle detail. Classic maillot silhouette. Full seat coverage. Nylon/spandex. Made in Italy. Marie France Van Damme "Rafia" two-piece bikini swimsuit set in textured microfiber. Straight bandeau neckline. Fastens at back. Includes matching swim bottoms. Fold-over waistband. Moderate seat coverage. Nylon/spandex. Imported of Italian material. Marysia "Santa Barbara" one-piece in microfiber. One-shoulder neckline. Classic silhouette with scalloped edges. Full seat coverage. Nylon/Lycra spandex. Imported of Italian materials.